Sean Sutton is red hot. No one can deny that. He currently leads all US high school boys in the 300 and 400-meter dashes indoors this year. Everybody in the fieldhouse knew it including Georgetown Prep's Russell Hornsby. When Hornsby learned that he would have a head-to-head matchup with Sutton across 500 meters, he didn't set a time goal for himself. Instead, he just wanted to win. Coincidentally, neither of the two seniors had ever raced 500 meters. Sutton is looking to build his strength and expand his range. Hornsby, the tall powerful 1:53 800-meter runner, is very well suited for the 500m distance but just never raced it. Both were entering unchartered territory and "meeting in the middle" in every sense. Sutton rocketed off the starting line and already had a gap on Hornsby at the break. Hornsby waited patiently for 350 meters. Just as Sutton was nearing the edge of his usual range, Hornsby made a powerful move into first. Sutton strained off the final curve while Hornsby powered home for the win in 1:05.98. Sutton finished second in 1:08.09. Hanging in the race was Landon junior Mac Hightower who finished surprisingly close to Sutton in 1:08.55. As far as I can tell, Hightower has also never raced the 500m. Despite the disappointing loss, Sutton said that he liked the 500 and could see himself doing it in college. Mostly he is just working on building his strength and looking forward to the stellar field at the Brooks PR Invitational in Seattle this weekend. Sutton and Hornsby saw each other again in the 4x400 relay at the end of the meet. This time Good Counsel had an insurmountable lead on Georgetown Prep by the time Hornsby got the baton. Surprisingly, Hornsby appeared to gain ground on Sutton with a 49 split to Sutton's 50. Good Counsel won the relay 3:27.03 to Georgetown Prep's season best 3:28.73. Despite his undeniable speed, Hornsby reassured me that he will be running the open 800 at New Balance Nationals after he runs a few relays at the Jesuit Championships at home this weekend. Georgetown Prep won the meet with 144 points. Georgetown Prep has a lot more talent this season than originally thought and in fact now has three boys under 1:10 in the 500. Coach Greg Dunston commented that they just keep finding talent, but says they will lose Sam Posniewski to lacrosse this spring. Andrew Gyenis and Joey Chapin had big days in the distance events. Gyenis ran a personal best 9:44.82 in the 3200 while Chapin ran a personal best 2:38.49 in the 1000m and won the 1500 in 4:21.64. The Georgetown Visitation girls won the meet with 140 points highlighted by a 11:44.12 3200 by Grace Carr and 1:23.74 500 from Stephanie Jones. Holton Arms' Natiaha Hinnerichs won the high jump with a leap of 5-04 and won the triple jump in 32-11. The original idea for this meet was to be an IAC/MAC/ISL Indoor Track Conference Championship Meet. Some schools could not change their schedule in time to attend this meet as the idea was only developing in January. Meet coordinator Addison Hunt also explained that some athletic directors in the MAC and ISL did not want their conference names to be included in the title of the meet. There is a resistance to the creation of an indoor championship meet from the schools that have limited or no indoor track programs. 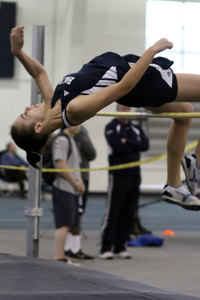 For now, this meet will simply be referred to as the IAC Invitational Tournament until more support is gained for an indoor championship meet. The coaches of St. Andrew's Episcopal School, among the smallest schools in the ISL and MAC, say their philosophy is "just run."